There are many ways in which you can make a difference together with Voices For Israel. Looking for a meaningful way to commemorate family and community milestones? Sponsorship opportunities are available for many of our projects, including concerts, CDs, community Shabbatonim, and more. For more information, please call (917) 797-9106 or email sponsor@VoicesForIsrael.org. Voices For Israel is the ideal fundraising partner for schools, camps, synagogues, youth groups, and other organizations. Voices For Israel CDs are a compelling and meaningful fundraising tool which also help promote Jewish unity and solidarity with Israel. 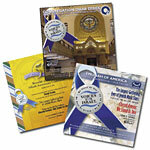 Available options include customized CDs featuring your organization's name or logo. Let us help make your next fundraising drive a success! For details, please email: partner@VoicesForIsrael.org. Show your customers and clients the depth of your concern and caring for fellow Jews in need! Find out about opportunities for your company to support Voices For Israel and give back to the community. For more information, please call (917) 797-9106 or email corporate@VoicesForIsrael.org.